The 2003 Jim Carrey vehicle Bruce Almighty, was more than just a box office smash for the ex-Ace Ventura actor. More importantly, it launched the film career of ex-Daily Show correspondent Steve Carell. His supporting turn led to not only a successful TV (The Office) and film career, but it is also partly responsible for the flop that is this sequel/spin-off to Bruce, titled Evan Almighty. The lack of Carrey seemed to be offset by Carell�s presence, but the movie was destroyed by critics and, while it still cracked the $100 million mark at the box office, failed as a big summer release with a budget of nearly double that. For those who still want to see for themselves, Universal brings the film to DVD, and at least the audio, video, and (number of) extras are impressive. Evan Baxter (Carell) has moved on from his job as a news anchor to having a Congressional seat. So, it�s off to Washington DC with his wife, Joan (Lauren Graham), and kids Dylan (Johnny Simmons), Jordan (Graham Phillips), and Ryan (Jimmy Bennett), where a nice, huge house awaits them. Evan�s campaign platform was to �change the world,� a message that apparently made it all the way to God�s (Morgan Freeman) ears. The man upstairs begins sending messages to Evan, but to hammer his point home, he visits the new congressman and tells him to build his own version of Noah�s ark. Completing such a task is far from easy, but if any man can do it, Evan can. This is a complete, total failure from beginning to end, with a total of maybe two laughs along the way. Perhaps things are played too close to the vest as this is far more family-friendly (it�s rated PG for goodness� sake) than the Carrey vehicle, and Carell is never allowed to truly let loose with even the slightest bit of crudeness. He doesn�t get any help from the supporting cast, with John Goodman, Wanda Sykes, and the usually-reliable (and fellow Office cast member) Ed Helms being rendered useless by the script as well. Only Freeman seems to be enjoying himself, but, for one, he�s playing God, and also, can handle these types of roles practically in his sleep. Evan gets hairier and hairier as the film progresses, eventually resembling Noah, himself. Unfortunately, it�s pedestrian sight gags like this that the film relies far too heavily upon, while not spending enough time on adding even the slightest bit of wit to the proceedings. There�s also too much reliance on CGI effects, as we�re asked to believe that Evan has truly wrangled up the animals for his ark, two-by-two. There are more computer-generated elephants, giraffes, and other wild animals than there are laughs to be had, and I would hope Evan, himself would find that almost sinful. Until this, the notion that Steve Carell could actually be (unintentionally) unfunny was a ludicrous one. However, this is proof positive that regardless of the acting talent involved, a horrendously written screenplay can render any potentially funny idea impotent. Carell can act as manic and try and milk his character�s out-of-his-element wackiness for all it�s worth, but there�s just no overcoming the completely unwitty, non-amusing dialogue. Carell will certainly brush this misstep aside and continue to watch his star rise, with a heralded semi-dramatic turn in Dan in Real Life and another hilarious season of The Office already under his belt. Here�s hoping a hilarious turn in the upcoming Get Smart will allow us to sweep last year�s big summer movie misfire under the rug as soon as it�s released. Image Transfer Review: The 2.35:1 anamorphic widescreen presentation is full of detailed images, but is somewhat lacking in sharpness. There are far too many scenes where the overall look is a soft one, including some instances of color bleeding and edge enhancement. The bleeding is the least frequent anomaly, though, as the bright, vivid color scheme does what it can to make up for the other issues. Fortunately, dirt, grain, and other flaws are kept to a bare minimum. Audio Transfer Review: The Dolby Digital 5.1 audio is also hit-and-miss, with active use of the surrounds throughout. The more active, animal-oriented scenes brought adequately loud, dynamic sound effects that coupled with tight, aggressive bass, gave the proceedings a nice punch. The dialogue is a bit tinny at times, and also has occasional problems blending into the overall mix and remaining clear. Extras Review: A large collection of extras begins with a 14-minute montage of deleted scenes that are introduced by Carell. These clips are mostly longer versions of scenes from the theatrical cut, none of which add anything to the unfunny original clips. We then get almost three minutes of outtakes (also introduced by Carell) that are fairly amusing, followed by The Ark-itects of Noah�s Ark. This is a six-minute featurette that chronicles the construction of the actual ark via cast and crew interviews and on-set footage. Becoming Noah takes a six-minute look at Carell�s hair and make-up transformation into the Noah version of Evan, while Steve Carell Unscripted gives us three minutes of the funnyman being his wacky self on the set of the film. Animals on Set Two By Two is a 13-minute look at the animals who worked on the film, providing a nice lead up to the Animal Roundup Game. This is a trivia game where correct answers will help Evan build his ark, and is actually one of the more entertaining of its kind. Next up is The Almighty Green Set, a five-minute featurette that looks at the environmentally friendly set, and segues nicely into It�s Easy Being Green, a four-minute piece giving us more tips on protecting our planet. In Acts of Random Kindness, we find the cast and crew telling stories of niceness for almost two minutes, and during A Flood of Visual Effects we visit with the technical experts behind the film for over seven minutes. Rounding out this huge collection of supplements is the nearly three-minute promotional piece Casting Call: Serengeti, and The Almighty Forest, another environmentally focused segment that runs almost six minutes and is a list of all of the people who planted a tree for a good cause. 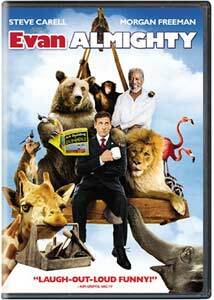 It�s easy to see why Evan Almighty failed to produce the same box office numbers that its predecessor put up. With a lifeless cast and an unfunny script, this film was a poor concept to begin with. The Universal disc isn�t without its technical problems either, although there is a large extras collection.